The theme of the assembly was inspired by a growing sense of urgency to care for life and seek justice. The logo depicts life breaking forth, bringing God’s justice to all the earth. The theme of the assembly was inspired by the diversity of Asian contexts and by a growing sense of urgency to care for life and seek justice. It is both a prayer and a statement of faith, calling Christians to engage with God’s vision of justice and peace, so that all may have life in fullness. The assembly logo is inspired by Isaiah 42.1-4 and the mission of God’s chosen servant to faithfully bring forth justice to every coastland – the servant who will not be crushed until justice is established in all the earth. It depicts life breaking forth from the ground – through rocks and chains – growing upwards, bringing God’s justice to all the earth. 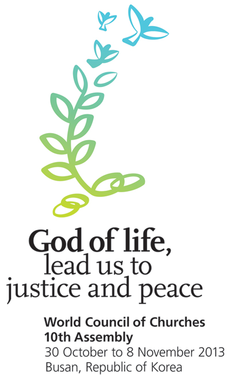 At the centre of the logo is an image of the tree of life – of Christ present in the world – carrying God’s justice to every corner of the earth on the wings of three birds.